At many regional theatres it’s not Christmas without Tuna. 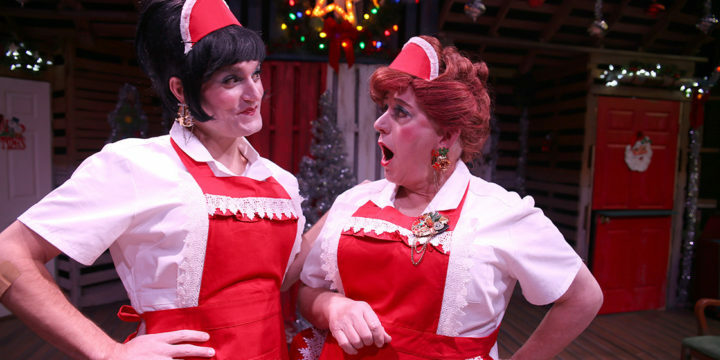 Since its 1989 debut as the second of a three-play series set in the “third-smallest” town in Texas, Tuna Christmas by Ed Howard, Jaston Williams and Joe Sears has quickly become a holiday staple of theaters around the nation. Part of its success is a spate of colorful small-town characters with equally colorful Southern sayings, all played by only two actors. 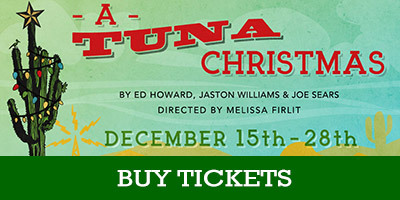 With agile and comically savvy actors, Tuna Christmas is a guaranteed crowd pleaser. For the production at Thingamajig Theatre, director Melissa Firlit works with veterans Dan Morrison and Dennis Elkins to play more than 20 wacky Southern characters, many of them women, and the duo proves up to the formidable task. Playing characters including a bouffant-sporting housewife, whose favorite Christmas memories include conjugal visits to her incarcerated husband to a hard-as-nails female proprietor of a used-weapons store who wouldn’t blink at shooting someone who stole her toaster, Morrison and Elkins delight in the campy shtick that defines Tuna. Kudos to Adrienne Young’s costuming and wigs, which facilitate Morrison and Elkins’s lightning-quick offstage wardrobe changes while clearly defining the multitude of characters the duo portray. Particularly enjoyable is her attention to detail in recurring Texan flourishes like the different variations of cowboy boots that appear. Thingamajig Theatre’s Winter Season opens on Friday, December 15 with A Tuna Christmas, by Ed Howard, Jaston Williams and Joe Sears — a brilliant and hilarious two-man show that takes place in Tuna, TX, where the Lion’s Club is too liberal and Patsy Cline never dies! Between the holiday yard display contest and the Little Theatre’s ‘A Christmas Carol’ on the brink of cancellation, it’s a miracle anyone gets tinsel on a tree. Two actors play all 22 colorful citizens of Tuna, including OKKK Radio hosts Thurston Wheelis and Arles Struvie who report on the small-town festivities. This satirical ode to the season is spiked with enough sass and shenanigans to make for one Texas-sized jolly holiday. DENNIS ELKINS has held numerous teaching and administrative positions in higher education in Tennessee, Georgia, South Carolina and Colorado. Directing credits include productions for Albuquerque’s Shakespeare on the Plaza, Fort Lewis College, and Milligan College. Elkins’ acting credits include productions with the Clarence Brown Company, the Colorado Shakespeare Festival, the Utah Shakespearean Festival, Single Carrot Theatre, Baltimore, Maryland… and Thingamajig Theatre Company (Hairspray, Cabaret, A Picasso and Red). Also, Dennis has recently been in Savannah where he was developing a solo show, Box, that deals with packing and unpacking the boxes in our lives. 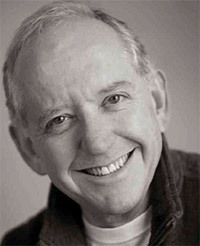 Elkins is a member of Actors’ Equity Association. DAN MORRISON, based out of New York City, is excited to be returning to PSCA, where he recently performed in God of Carnage, Hairspray, Big River and Aida. He has performed and studied all over the world, and if you are interested to know, he would love to talk about his experiences. 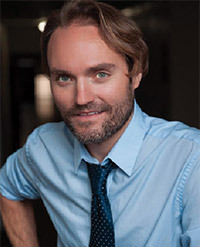 Dan earned his BA in Theater Arts from San Diego State University and his MFA from The American Conservatory Theater in San Francisco. He is always ready for the next big adventure! Visit his website at www.dan-morrison.com for more information. A proud member of AEA. Much love and respect to his family and friends and to Pappy: Tis’ A Brow Breckt, Moon Leckt, Neckt ta Neckt. Production Team: Directed by Melissa Firlit; Set Design by John Santangelo; Costume Design by Adrienne Young; Lighting Design by Mandy Heath; Sound Design by Melissa Firlit; Dressers, Ahia Kaiser & Sophia Raymond; Art Design by Jill Fives.